Born in Morgan City, Louisiana, Author/Illustrator Michael Verrett grew up blocks away from sugar cane fields and the unhurried Bayou Teche. He and his wife, Melissa Garbarino Verrett live near Baton Rouge and are members of Christ’s Community Church. A writer and illustrator, Michael has contributed to or created over 50 books in YA, chapter books, elementary, picture books, and photo books. His cartoon strip, Army Life, appeared weekly in The Desert Voice Magazine. Michael studied writing at the Institute of Children’s Literature, creative writing and art at Louisiana State University, art at the Scottsdale Art Institute, Scottsdale, AZ, and facial forensic art (police sketch artist) at the FBI Academy in Quantico, VA.
A retired homicide detective/sketch artist, Lt Colonel (U S Army), Michael has worked in Anti-Terrorism and Homeland Security. An Army veteran, Michael was awarded the Bronze Star as a member of 3rd Army. His duties took him from Asia, to Africa and the Pentagon. His cartoon strip, Army Life, appeared weekly in the The Desert Voice. He is a recipient of the Crystal Apple award for top volunteer in East Baton Rouge Parish schools. He is a member of several writers groups in his region. He conducts art/literature programs for libraries and schools. 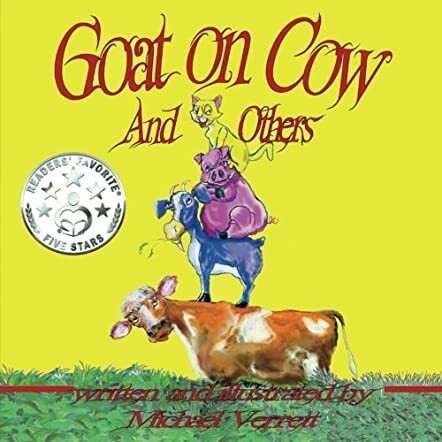 Goat on Cow by Michael Verrett is the delightful story of a kind, caring, and patient cow. Her life was always happy and she grazed on tasty grass and sweet clover in a green field. One day after sunset there was a storm. The moon did not shine, the old owl and fox did not sing, and the cow also did not sing. The next morning, the cow noticed something strange had happened. There was a goat on her back. Though the cow asked the goat to go, it did not go. The next day there was a pig on the goat's back and the day after that a cat. The cow could not bear the weight and fell over with a thud. The pig, goat, and cat walked away, saying the cow was not caring and patient. Would the cow be able to get up and would everything be all right again? Children will love the story and it will also tell them about the patience of the cow. The illustrations are wonderful and they breathe life into the characters and the story, giving it a good pace and movement. The illustrations are helpful and enable young readers to connect better with the characters. It's a good bedtime storybook to read out to kids and can also be used for interactive sessions in classrooms and school libraries. Children will love the character of the cow and her peaceful life until the goat, pig, and cat arrive. The story also shows the patience of the cow and the heartlessness of the goat, pig, and cat.